The split air conditioner is unique in that it separates the temperature from the humidity during operation. It presents as two different units with an indoor and outdoor part. The indoor item has a blower with evaporation and the outdoor item consists of compressors and condenser coils. Despite being separate, these two units do work together to provide effective cooling. This article will provide some information on how they do this. Similar to all other air conditioning systems, the split air conditioning system has a compressor, condenser coils, an expansion joint, and a ventilation fan. The difference is that these items are located in the outdoor unit, and the indoor unit holds the evaporator coil, the blower, and the filter. Furthermore, the system has different individual unit boxes that work with the thermostat that manages the full system. A refrigerant is pressurized in the outdoor unit’s compressor coil and results in a gas within the unit being heated. The gas will then pass through several tubes in the coil which changes gas to liquid. The liquid is pressurized and travels through the outdoor unit’s condenser coil to the expansion joint. Once it passes through the joint, it will reduce the amount of pressure and revert to gas. This gas releases heat and then adopts a colder temperature. The gas returns to the compressor and repeats the process. The indoor unit will use air drawn from the room and pass it over evaporator cools to lower its temperature. The cold air will blow back into the room using the blower and will circulate throughout the room until it reaches the desired temperature. When this set temperature is reached, the system will shut off automatically. You may be asking the question: how does the unit operate in conjunction when they are in two units? The outdoor unit equipment is connected to the indoor unit equipment through a series of tubes. Great, but is it effective? Yes, it is; of course, it is. Firstly, the split air conditioner has a larger compressor when compared to the window air conditioning units. This means that it can cool a larger area space. Secondly, the split air conditioner cools rooms without any ducting and is a simpler system. This means that you can attach the compressor to different ductless units giving you more control over the areas from an independent location. The next issue for effectiveness is maintenance. 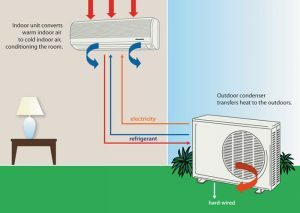 The split air conditioner system is very easy to maintain – both outdoor and indoor units. A final concern for effectiveness is the efficiency rating. If a conditioning unit is not running in a specific room, this means it is not operating and no operation cost; however, the compressor is always prepared to allow for cost-effectiveness in the starting and shutting down of the unit. It is a little-known fact that the majority of the cost of an air conditioning unit lies in starting and shutting down costs, and this reduces the amount. In truth, no difference exists between a central air conditioning system and split air conditioning systems except that the split air conditioners do not require ducting. However, when comparing this system to a window or portable unit, the difference is greatly obvious! The portable unit is less effective due to its size and only targets a small area space; whereas the split air conditioner cools the full room. Also, the split AC has a larger overall capacity and compressor when compared to the portable AC.